What a fun month of book birthday celebration it has been. We are bringing it to a close with one final giveaway. We chose objects that represented home. I think "home" has a special meaning for us at Beaducation. Not only do we regard our jobs (and lovely new workspace) like a second home and our co-workers like family, we also want our customers to feel that they have found a home, too. It's great to talk to our customers and feel like they are old friends. We love sending out product from our home to homes all over the world, and of course we LOVE that Lisa's baby has found a place in so many of your homes and studios. This nice little collection is ready to come home to you. This bundle includes a Beaducation Original House stamp, a Tiny Heart stamp, a Flower stamp, a brass key charm and a couple of copper blanks to make your own house charm. All you need to do is add your favorite letter set and stamping tools and you are ready to go. To win, leave us a home-themed comment below. Where is your dream home? What does home mean to you? Where do you craft at home? A favorite quote or saying? The contest ends Monday, August 1 at 9 AM PST. For extra chances to win, help spread the word through your social media outlets (FB, Twitter, your blog), link back to this post and leave a comment below for each. One comment equals one entry. Good luck! Home is My Family. We just moved into a house from a small apt, so home is wherever we are together. To me home is wherever my family is. I hope to always live right where I do, but I know as long as my family is there we can make any place a home. My little home is in Northern Michigan and we love living here! Home is where family is, for me. I usually craft in an extra room where my supplies are. Would love to win the last giveaway for this month. i have moved a crazy amount of times in my life, so home for me is not any one place--my home is my husband and my girls. "May your home always be too small to hold all your friends. And may the roof above you never fall in,and those gathered beneath it never fall out." It was part of a toast at our wedding and I always think of it when we fill our house to the brim with family and friends for holidays and birthday. We are very blessed! A saying that is common in military homes as we move so much and often have little choices about our moves. "Grow where you are planted." for me, Facebook has become a substitute home because I sit at my work desk for long hours, but I can check in frequently to visit with family and friends, and find out what is going with people no matter how remote they may be. A home isn't 4 walls, it's the people inside. my home is full of blessings...6 of them...they are my heart and it would not be home without them :)cheri c.
a home isn't given, it's made, with love. Home to me is where I am safe and comfortable. Where my daughter and Husband are. Where there is endless amounts of love..:) At home I like to craft in the dining room at night after the baby is asleep. My Husband and I are looking to buy our first house soon so maybe I will get my own craft room! Fingers crossed! And your heart will lead you HOME. home is where the heart is, where the flowers bloom and the key to your existence. love , love , love all your items. Home for me growing up has always been where ever we were together as a family since we have moved alot and now as my children are growing up, I continue with Mom's thought, home is where the family is. There's a saying... Home is where your heart is... That I think is true for everyone. I grew up a block over from where I live now and always knew I wanted to raise my own family in the same area. After looking at what seemed like thousands of homes we finally found one that (almost) felt like home. A few renos and 2 babies and a ton of memories later it's now without a doubt our home. Not so much the house itself but the people that make it worth coming home to when the day is done! At home, I craft at the kitchen table mostly. It's old and beat up a bit, so I don't mind a few extra marks. Homes can be so important, so central. I'm not one of those who can have my life in a backpack and travel like a vagabond, not attached to any special place. But I feel I can live anywhere and anyhow just as long as my parental home, our farm, is still here and that I can come back whenever I want. I don't have to live here, just as long as I can take comfort in knowing it's there. That it always will. I can't even imagine what it'd be like not having the farm in the family! I'd be horrible, losing such an important part of my life. While we've never talked about it I've always thought of it as obvious that me or my sis will take over one day, that the place with remain in the family at least throughout our lives. I do truly believe that home is where your heart lives and currently I am in my dream home raising my family and cherishing every minute of it. I even bead while enjoying family time in the living room. My home is where my family and friends are. After moving around a lot when I was little, i learned that home was not a physical structure, but any place my heart felt loved and safe...and so today, i try to make my physical structure (and my jewelry) a place where other people's hearts feel loved and safe. I can't wait to make my home somewhere that it doesn't snow. This unfortunately is far in the future. Hi Lisa & the gang over at Beaducation, first off i would like to say thnaks for all of these amazing giveaways, i hope these giveaways have introduced a new technique to some who may have never had the oppertunity to try stamping b4! Favorite quote right now is Home Is Where Love Resides, Memories Are Created, Friends Always Belong, Laughter Never Ends. Home is where I do all my creating and most of the inspiration comes from those in my home. My family is a constant source of support and creative muse. Without my home there would be no art in my soul. My mom used to have a sign in her house that read, "Come in, sit down, relax, converse. My house doesn't always look like this, sometimes it's even worse!" Home is wherever my family is so as long as I am with my family, I am home. Home is where your heart (my family is). I don't live in my dream house, but, we are together and healthy, so we have everything we need to be happy! Home is, truly, where your heart is. My husband and I are newly weds, eeek!! We have a dream of owning a beautiful home in Oregon and raising a family there. We're both working really hard right now to get there, (we live in Vegas). Home is a place I can relax and create in it is where my family is and where I love to be..
At home, I craft in my beloved sunroom. The sunroom has 12 big windows that I get to stare off into while brainstorming. Colorful pictures and decorations fill the room! I've got a big yellow comfy chair and a half in the corner, which is my little happy place. I share my sunroom with my two dogs and cat. I could literally spend all of my time in this one room that means so much to me! Home is where I can walk in and just feel the stress of the day leaving. Home is where I make it. Whether it be my house, a friend's, a vacation spot, as long as I am comfy there, I am home. The saying "Home is where your heart is" is so true for me as we have been moving a lot and even today the place where I live is not where we will be staying. home is where my family is...never thought i would be a mom or a wife. and i have two kids and a wounderful hubby, that takes great care of us. At home, I craft EVERYWHERE! I have a large family ... five kids ... I see home in each of their eyes. They are all but one in their teen years so sometimes it is hectic & stressful ... but I wouldn't leave the comfort of 'my home' for anything! "A house is made of bricks and beams, a house is made of love and dreams"
Home is wherever my family is (this includes our dog). As for me, I am also "at home" in the kitchen, craft room or outside (during any of our crazy Michigan seasons). Home is a refuge against the rest of the world. It doesn't really matter where it is. As long as it is your "safe place" . Though I have to say after living in our previous home for 22 years and moving to this small house it has been a difficult adjustment. I've always had a craft room, but found it hard to work in while the rest of the family is elsewhere in the house. So there is always a little part of the living room carved out for me and my current project. Home is the city where I've lived all of my life. My family is here, my friends are here, and my little nature area in my backyard is where I find peace. My home is my heart. As long as I give and get love from my son and husband I'm home. I also carry my two angel babies in my home wherever I go. Starting this military life will prove that our house will always change, but our home will be stronger than anything we could build. Home is in Alaska, where Gramma lives with me and my son and a clever little min pin who alerts us to every little noise outside and the occasional noise inside. Our family of four loves our home sweet home! Surrounded by family and nature, my home is the center of my creativity. Home is my favorite place to be. My husband and I share an office at home, so when I craft he's working next to me and it's my favorite time. Home is wherever my boys are. Now that they are adults it's not always at our house but in my heart. My home is a little Mobile Home is in the middle of the woods, in the most beautiful part in the world, north west Montana. Sadly, after almost 40 years in the Us, My heart is still in Southern Germany were I was born and raised. Home is where my family is! My home is my safe haven,also the place I can design and create! Our family is where our home is...currently in the San Jose/Campbell Area. Our dream home is somewhere that we can finally own ourselves, but for now, we're quite happy. Crafting on the couch in the family rooms is where all the action happens. The middle of chaos between the 6 year old, miniature poodles and the fun! Home is where the heart is whether that be family, friends, and comforts. although i only own one house, i enjoy three as 'home'. the one i live in. the one i visit where my mom lives. and the one i vacation at in negril. We just recently moved into our dream home which has both an office in the basement so that I can telecommute and my studio! Just tweeted about your giveaway. who says you can't go home." Just posted on my facebook page about your giveaway. Home right now is in Colorado- a lovely old home that has been fun getting back to shape- still have a lot more work to do! My home is with my husband and my 2 boys. Yes we have roots in our community, but as long as we are together, any place is our home. We just listed our home and have our hearts set on a new home in a quaint little village. Thanks for the giveaway!! Our home is in Richmond, VA, it is where we raised our two daughters and is now a quiet loving place they can come home to and liven things up a bit! Just discovered Beaducation, LOVE IT! I started crafting in a corner of one room in our home but now have taken over the whole room and the table in the dining room. I have to push everything to one side for the family to eat supper there. Home is where they love you, love my fam and love your site. Home is a mess- but it is home! "Love grows best in little homes"
I am a "Home Body" Originally from NY now in Virgina we raised our two kids in our current "Home" I have my "Craft" room, flower & vegetable gardens and two dogs! Home is family and pets all living together! My favorite quote about home is “He is the happiest, be he king or peasant, who finds peace in his home”. Thanks for the giveaway! Home is anywhere that you are surrounded by the ones you love and those who love you back just as much. Home is where your Hero is! Home is the place where you live with your family and feel safe. Home to me is where all my loved ones are always there, my husband and my animals. I just moved to a dream cabin in the woods in North Carolina and I am still unpacking! I have an un-finished attic I plan to make into my crafts room. It is very tall and has many windows. My favorite quote is " Make memories because no one can take them away"! I say this after losing all I owned after 911 and reflecting back on my memories of them. 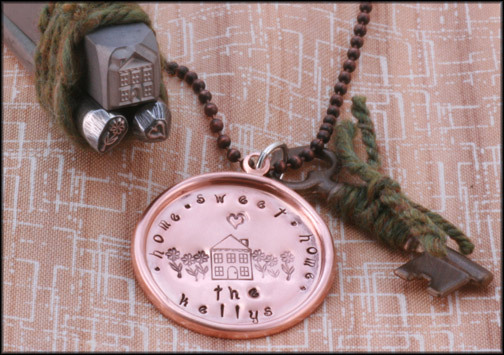 A house charm, what a lovely idea and items to make a complete charm/pendant! Home is wherever my son is! I craft either at my kitchen counter or my dining room table and I have all my supplies in a tote. Home is where your heart is. My house maybe small but it has sheltered me for over 30yrs. home is where i love to come to when i get off work, i shedd my uniform and enjoy my fam. I love to work on projects in my craft cave...it is a little slice of heaven in my home. My dream home has a huge craft room and my wonderful hubby (not necessarily in that order! ;-) ). Thanks for the opportunity to win! We have made this house our home - It is where we spend time together as a family. It is our cozy retreat. Home is wherever my husband and kids are. We dont need a lot of room, just each other. I believe there is a difference between a house and a home. My house is small ... but it is home. I hope to have a craft room someday ... if the adult kids ever move away from home. We built our dream home 7 years ago - a beautiful Colonial. But then we developed a new dream :). Now we'd love to have a farmstead with a much smaller house - but one that would still allow me to have a craft room of course. I would like to have a home on the water somewhere in a nice climate. Home is where my husband, son and animals are. I don't have a craft room so I do most o make work in my bedroom. My favorite saying is: "Life is not measured by the number of breaths we take, but by the moments that take our breath away""
My craft area is in the sitting room of our bedroom. Some days you are the pigeon and some days you are the statue. beautiful mountains of central WA. Just tweeted again about your giveaway. And saw the new class was up. Checking it out. Thanks. Home is all about my kids, my husband, and the rest of the wonderful people in my life! I craft in my basement, my son's old bedroom. Great giveaway. My house and where I live is in Louisiana BUT my home and heart is in California. "Home is where the heart is", one of my favorite quotes. I create in a corner ( a nook) in our home. Just off from the living room, I guess I would call it the dining room space. As my skills and creativity goes, so does my need for more space! Just linked this to my FB page! My dream home would be a house on the beach somewhere...but I think really home is where you make it and where your loved ones are. I'm at home in Ohio where all my family lives. I craft up in my unfinished attic. It's great because I don't have to worry about a mess. Home is you keep your heart, it's connecting to family and friends. her spirit is always with me. home is where you feel safe and loved. They have to take you in." Something you somehow haven't to deserve." ~from 'Death of a Hired Man by Robert Frost. I love Robert Frost's poetry. This was the first thing that came to mind when I saw you ask for something 'home themed'. My home is where I can be myself evry single minute, it's where I feel at my ease. I feel at home when I know that people won't judge me if I make some mistake and will help me out rather than point the finger. My bead table is a part of my home. I can express myself in my particular way and I know that anyone can interfere with what I do. Home is my happy place where the sun shines and the wind blows, but even rain won't dampen my spirits because when all else fails there is my jewelry making room! My home is a place that is constantly changing, evolving even. It's not the last home, but was our first. It's the transition home to something a little bigger, roomier and hopefully home-ier. It's the place that my children bring friends, that family gathers and that our closest friends (who are basically family) come to eat, play and laugh. It's the place that I have learned to be a mother and wife. A cook, a decorator, a nurse and all of the other titles that I can think of. It's the "Green" house. It's the place of love and safety in our lives. Home is where my husband is. Just to be together is a blessing! My dream would be to have a super duper craft room with a fancy desk and tons of organizers! I am living in my dream home! I have the greatest craft room/laundry room. It is as big as many kitchens!! I love it!! Home is where my family and my heart is. Without my family, I wouldn't be comfortable anywhere. When i married hubby 20 years ago he was in the early years of his military days. For us, "home was where we lay our head " we made each house a home no matter how odd it may have been, or how long we would be there. One of my friends called my home a "hobbit hole" which has everything cozy and crafty that I need to keep myself occupied. There is simply no place like home. I know it sounds cliche but I am currently living about 2500 miles away from home and I truly appreciate what my home means to me. i have sand in my pockets, anywhere near the ocean is where i feel home. "There's no place like home!" Even though our 4 children have grown and left our nest, I still include them in the word home- along with our 3 dogs and cat!! Home is where I can be me- good, bad or ugly. When I come home at the end of a crazy day, I can take a deep breath and it helps remind me of what's truly important in life. Home is always where my family is, but right now I sure miss Northern California. Being military, our home is where the Air Force sends us! :) We make it work wherever that might be. Home is heaven and family all wrappped together! My home is where the dust bunnies roam and where family and friends gather. My craft room door is closed though because I'm always in the midst of brainstorming and sorting through supplies on hand. Home is very full right now! Our empty nest has lots of chicks...My Marine came home with his family and we've combined households for a bit while they get on their feet. I am so blessed to get to be a part of their lives for a while. For me home is where I let my hair down and feel at peace. My craft room is upstairs in my home and is a place that I get to visit rarely. When I do enter my 5 year old often follows and side by side we get inspired by the things in front of us. We create and enjoy. We are calm and there are no struggles. When I allow myself to take the time to enter, my craft room is like my meditation. Even though we are "empty nesters" - we make our home in Iowa. It's a spot where our children can all gather - even though they are spread out over the United States. Home is where the heart is! Being retired military (USMC) we had many homes. It didn't matter the style, size or location. Each one was filled with love and laughter because we were together. We just bought our first home,but no matter where we live as long as we have each other its home.